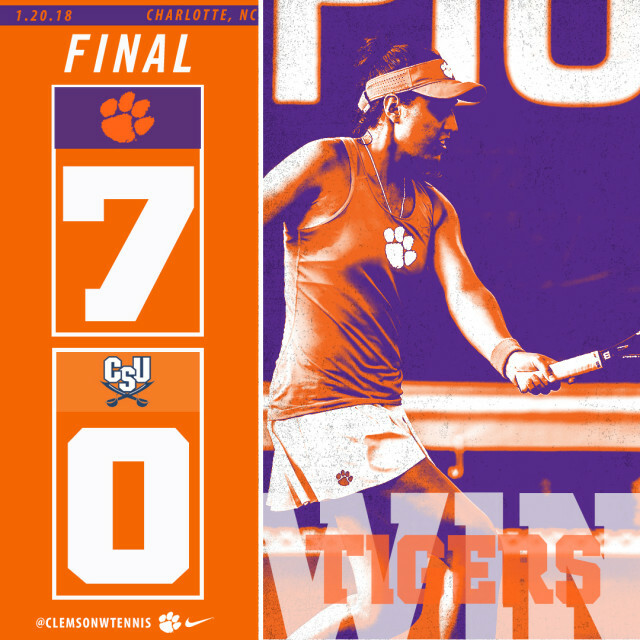 CHARLOTTE, N.C. – The Clemson women’s tennis team opened the 2018 season with a 7-0 win over Charleston Southern and a 4-0 win over Appalachian State on Saturday in Charlotte, N.C. The Tigers were a combined 9-0 in singles play and 5-0 in doubles play and did not lose a single set in the two matches held at the Charlotte Indoor Tennis Center to start the season 2-0 as a team. Junior Marie-Alexandre Leduc, the nation’s 20th-ranked singles player, was 2-0 at No. 1 singles, winning 6-1, 6-2 over Charleston Southern and 6-2, 6-0 over Appalachian State. Sophomores Tate Schroeder (No. 3 singles) and Constanza Gorches (No. 5 singles) were also 2-0 in singles play, while three other Tigers (Sydney Riley at No. 2, Fernanda Navarro at No. 4 and Daniela Ruiz at No. 6) won one singles match apiece. Leduc and Navarro combined to go 2-0 at No. 1 doubles, while Gorches and Riley were 1-0 with a win over the Buccaneers’ No. 2 doubles team. At No. 3 doubles, Ruiz and freshman Laura Marti won versus Charleston Southern, while Schroeder and Ally Miller-Krasilnikov picked up a victory against the Mountaineers. The Tigers will be back in action next weekend when they travel to Columbia, S.C. for the ITA Kick-off Weekend. Clemson faces Southern Cal on Friday, Jan. 26 at 10 a.m. in the first round, and will face either South Carolina or Oklahoma on Saturday, Jan. 27.